It remains to be seen whether this so called ‘new Iraq’ is as post-sectarian as some academics and journalists claim. 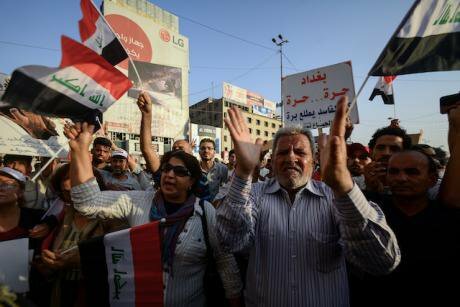 Iraqis protest against unemployment and lack of public services in Baghdad, 27 July 2018. Picture by Ameer Al Mohammedaw/DPA/PA Images. All rights reserved. Iraq arguably entered a new phase of ‘post-sectarianism’ since 2015. This was evident during the popular protests that began in the summer of 2015 and returned significantly in the summer of 2018 – when Iraqi political activism transformed from identity politics to being issue based. This showed that the protests are driven by frustration and demands for improving the poor public services and the high unemployment figures, rather than the usual politically led religious and ethnic differences. Specifically, the transition was motivated by the failure of the ethnic-sectarian political class in providing efficient public services, education, health care, security and development necessary for society. Is this enough to say that we are in an era of ‘post-sectarianism’? Iraq’s post-sectarian phase could be noticed when the main attention of Iraqi politics moved from being about sectarian identity to becoming about demands and specific issues related to services and rights. There are several important incidents that must be noted when talking about the fragile post-sectarian Iraq. One such incident is the announcement by the Iraqi Army that all Iraqi cities were liberated from ISIL in 2017, and the second was the failure of the Kurdish independence referendum on September 25, 2017 and the Iraqi army’s retaking control of Kirkuk after years of Kurdish Peshmerga rule. Those two events among others provoked a sense of social hope and reconnected people to a unified and sovereign homeland. However, it should be noted that the Kurdish reaction differed towards the outcome of the referendum - as it consisted of more losses than gains. Apart from Kirkuk being the most strategic and disputed area between Erbil and Baghdad on the Kurdish issue – the Iraqi government also demanded re-control of the airports and the borders.